Gears of War is a is a tactical third-person action-heavy sci-fi shooter video game exclusive to Microsoft Xbox 360 game console. Published by Microsoft Game Studios and developed by Epic Games using the Unreal Engine 3 technology, Gears of War has sold more than a million units, and played more than 10 millions game-play sessions in Xbox Live multiplayer mode in its first two weeks of release, and available in both standard and limited editions. 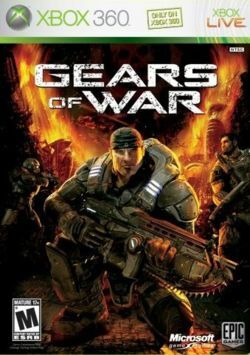 Gears of War centers around protagonist Marcus Fenix, and the conflict between the human inhabitants of planet Sera fighting a vicious subterranean alien race enemy known as the Locust Horde, and delivers an exhilarating, tense and creepy experience for players 17 and older, by assuming role of a futuristic soldier for the Coalition of Ordered Governments (COG) which is played from a third-person “over the shoulder” camera perspective. Weapons available to players range from pistols and shotguns to grenades and assault rifles (complete with a chain-saw bayonet) to the Hammer of Dawn, a weapon that communicates with a satellite and beams down a deadly laser strike that can level buildings.